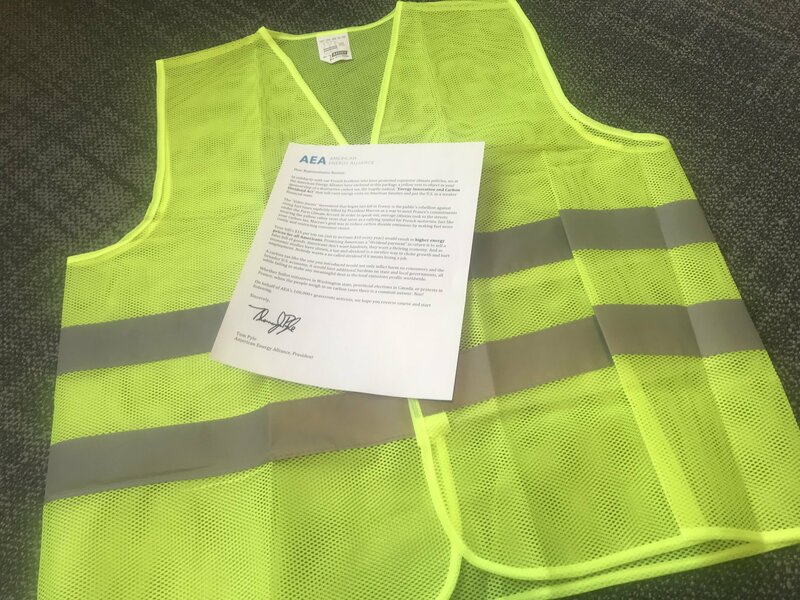 In solidarity with our French brethren who have protested expensive climate policies, we at the American Energy Alliance have enclosed in this package a yellow vest to object to your sponsorship of a destructive carbon tax, the inaptly named “Energy Innovation and Carbon Dividend Act,” that will raise energy costs on American families and put the U.S. in a weaker financial state. The “Gilets Jaunes” movement that began last fall in France is the public’s rebellion against rising fuel taxes explicitly billed by President Macron as a way to meet France’s commitments under the Paris climate accord. In order to speak out, average citizens took to the streets wearing yellow safety vests that serve as a rallying symbol for French motorists. Just like your carbon tax, Macron’s goal was to reduce carbon dioxide emissions by making fuel more costly and restricting consumer choice. Your bill’s $15 per ton tax (set to increase $10 every year) would result in higher energy prices for all Americans. Promising Americans a “dividend payment” in return is to sell a false bill of goods. Americans don’t want handouts, they want a thriving economy. And as economic studies have shown, a tax-and-dividend is a surefire way to choke growth and hurt employment. Nobody wants a so-called dividend if it means losing a job. A carbon tax like the one you introduced would not only inflict harm on consumers and the broader U.S. economy, it would foist additional burdens on state and local governments, all while failing to make any meaningful dent in the total emissions profile worldwide. Whether ballot initiatives in Washington state, provincial elections in Canada, or protests in France, when the people weigh in on carbon taxes there is a common answer: Non! On behalf of AEA’s grassroots activists, we hope you reverse course and start listening. AEA will hold lawmakers accountable for any sponsorship or votes cast in favor of carbon tax proposals in the 116th Congress. These actions will also be scored on the American Energy Scorecard.